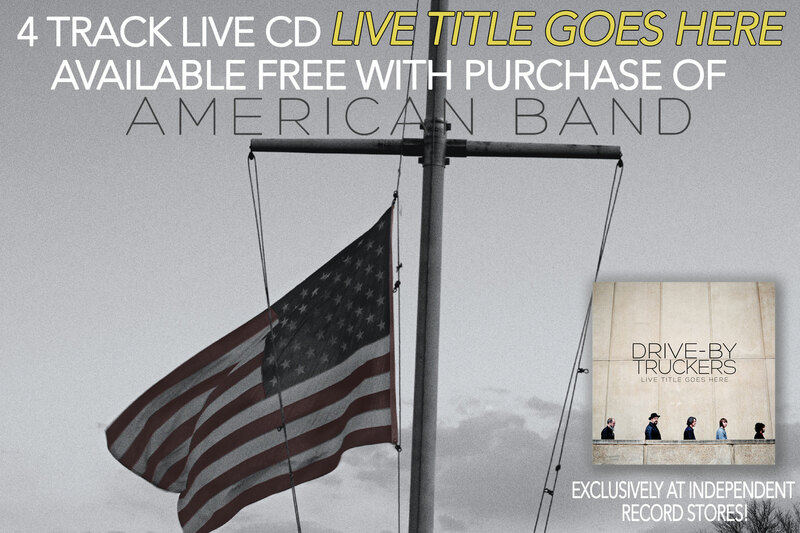 Starting this Friday 9/30, head to one of the below Independent Record Stores to receive an exclusive 4 song live CD from Drive-by Truckers entitled Live Title Goes Here for free when you purchase their brand new album American Band on CD or LP! This limited edition EP features amazing live renditions of the below songs, taken from both the new record American Band as well as the classic Southern Rock Opera & Brighter Than Creations’s Dark albums! Greenlaw's Music Inc. 633 Main Street, Laconia, NH 03246 Greenlaw's Music Inc.
Music Matters Inc. 196 State Rd 312,Riverside Center, St Augustine, FL 32086 Music Matters Inc.
Sound Exchange, Inc. 14246 North Nebraska Avenue, Tampa, FL 33613 Sound Exchange, Inc.
Hibberts, Inc. 142 S. Easton Rd, Glenside, PA 19038 Hibberts, Inc.
Hitt Records Llc. 10 Hitt Street, Columbia, MO 65201 Hitt Records Llc.